Studio doors are open and the public is welcome to come explore the life of the working artist, shop and enjoy our beautiful garden. 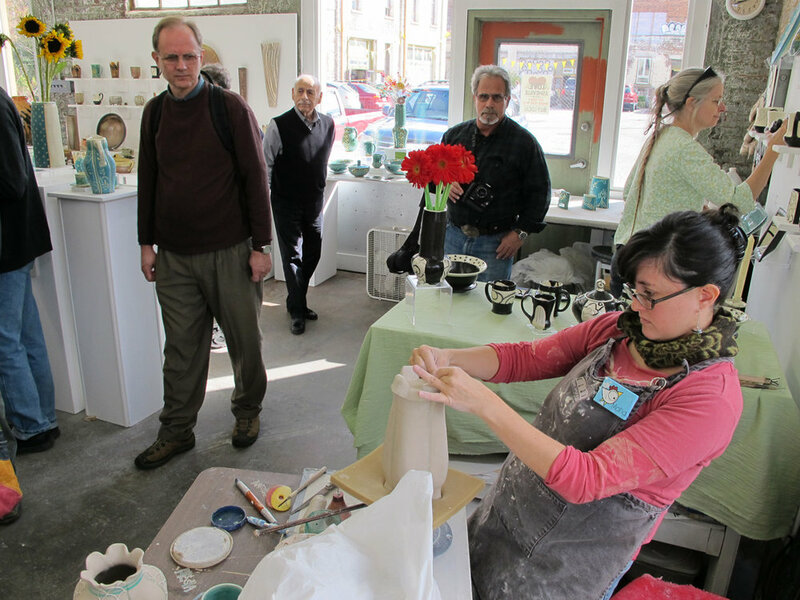 At CURVE studios & garden, located in the heart of Asheville’s River Arts District, you will find 12 artists working in their studios making ceramic sculpture, functional pottery, jewelry, clothing, wood game boards and fine art photography as well as teaching the art of chair caning. CURVE studios' mission, since 1989, has been to bring people to art and art to life in Asheville’s River Arts District. The Studios at CURVE are open to the public Monday – Saturday 11am to 4pm or more as the spirit allows. The Garden is open from dawn to dusk. CURVE has ample parking for our patrons and there are public bathrooms across the street @ 14 Riverside Drive. CURVE takes New Years Day, 4th of July, Thanksgiving Day & Christmas Day off. Our hours in February can vary so call ahead to make sure the artist you want to visit will be in their studio. The garden here @ CURVE is available for special events. Please ask for our rate schedule. Professional Photographers must get permission as well as provide a location fee for the use of CURVE for photoshoots. Please make inquiry to ask for our rate schedule.